This Autumn the Scottish Friendly Children’s Book Tour took legendary, Carnegie award winning author and screenwriter David Almond on a blustery trip round the Scottish Borders, East Lothian and Midlothian. 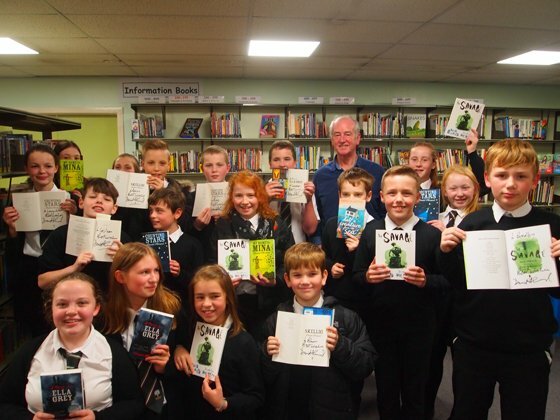 S1-3 pupils from local secondary schools had been excitedly preparing for David’s visit, with the help of school librarians it seemed everyone knew about David and his books, especially Skellig, the book that made his famous in the world of children’s books. David saw lots of different groups in big theatres, school halls, beautiful libraries and tiny classrooms, and whether he was talking to 12 or 250 pupils, he was able to capture the imaginations and undivided attention of the whole audience during the event. The aim of his sessions was to show how everyone can be a writer if they just open their imaginations and that the process of turning imaginative thoughts into written words can be fun and even easy! He talked about his childhood and how he uses memory and imagination to create the worlds of his stories, conducted imagination experiments and quick-fire writing exercises to show just how quick our imaginations are at coming up with ideas. Several schools had already been busy with their own writing projects surrounding the visit and thoroughly enjoyed David’s session feeding into their own ideas for writing. A huge thank you to David and to all the schools we saw for a fantastic week! Congratulations to Jenny from Angelsey who won a signed copy of A Song for Ella Grey in our David Almond competition. Over 200 pupils bought a book – not bad for a teen audience! 400 ‘Great Worms of Clute’ coming out of the imaginations of pupils and invading Scotland!